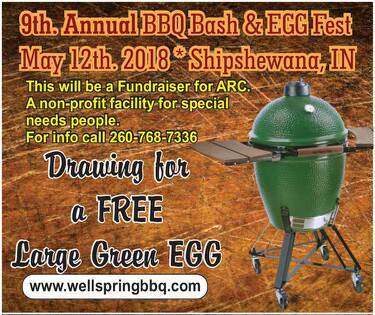 Win a Green Egg Grill at this year’s 9th Annual Wellspring BBQ Bash & Egg Fest taking place on May 12th. 2018 at Wellspring BBQ in Shipshewana, IN. This year’s event will be a fund raiser for ARC, a non-profit facility for special needs people. Admission will be by donation and all the proceeds will go towards this local organization. All the BBQ Chefs that will be attending will provide their own meats or find sponsors and so all the food that they will prepare on their grills may be sampled by the attendees. It’s a great time to hang out and swap grilling tips, eat BBQ and help a great cause at the same time. Chefs that are interested in participating may click here to download a registration form.